A couple of pests would be wondering along the street and enjoying the nice chilly weather. These pests happened to be two little brown cockroaches. This lovely couple will be looking of a place to inhabit for the fall and winter. They want a place that has at least four people living in the residency, a mom, dad, and two kids. Plus, the house needs an attic. These two little cockroaches spotted a family pulling into their driveway and unloading groceries. The house had an attic. It was a family of four. This couple looked at eachother and smiled. They walked themselves into the house, looked a the groceries sitting on the kitchen counter, went through the air conditioning vents and settled themselves in the attic. That was going to be their home for the next two seasons. The family of four did not notice the cockroaches until the first few days of spring. Encountering a pest in your home is the most unpleasant idea! Many people believe that their homes are pest free. Little did they know that pest can be dormant and most likely introduce themselves in the spring and summer. Apparently pest love the outdoors when it is nice and chilly out. However, once a pest is spotted inside, it is most likely that there are many others hiding between the walls. Many people aren’t aware of this fact, which it is essential to contact a pest control company in Mesa to take care of the situation. An exterminator is well familiar with the common household pests that are seen in Arizona homes. Pest such as ants, scorpions, cockroaches, spiders, bees, terminates, mice, rats and many more are found in good hiding places inside your house. The most common place is the kitchen. Where all the food is. When spotting one pest wondering around your home, check the kitchen cabinets and pantry first. Dry food is commonly stored in those places, which create heaven for pests like ants and cockroaches. The second common hiding place is the attic. The attic gets less traffic throughout the year, and creates a good habitat for household pest. The pest are left alone and are allowed to breed with no worries. Another similar place would be the basement. This room also receives less traffic. The basement is a damp environment and has access to water. It’s also a place where most people store dry food. Pest, mice for example, are frequently found roaming the basement. Receiving pest control services, like Varsity Termite and Pest Control, will search and invade these hiding places to get rid of the unwanted pest. Unfortunately, the list of unwanted pest does not stop in the attic or basement. Bathrooms, a room with constant access to water, is another place that pest invade. Along with small, compact, crawally spaces like under the deck. Household pest that settle under the deck are more difficult to spot, since they also have access to the outdoors. It gives them access to the house if the property is not sealed property as well. It is important to contact an Arizona exterminator to breach these places and get rid of those unwanted and unpleasant pest. While you have the exterminator in your house, make sure every room is checked off. National Pest Management Association conducted a survey that gives the following numbers about the regular places ants are nested: 73% inside the walls, 61% in bedrooms, 60% in living rooms, 54% in basements, and 37% in air conditioning and heating conditions. Varsity Termite and Pest Control are well trained and have a great track record of getting rid of ants. Kitchen, attic, basement, bathroom, living room, decks, and air conditioning and heating conditions are the hiding places for all pest. It seems like there is no escaping from these unpleasant invaders. Once you attack a room, the pest have already invaded another. Feels like a wild goose chase, or better said, wild pest chase. No one wants to be calling and paying the exterminator every moment of the year to take care of pests! Fortunately, Varsity Termite and Pest Control have year-round service and are taking care of your home as if it was their own. 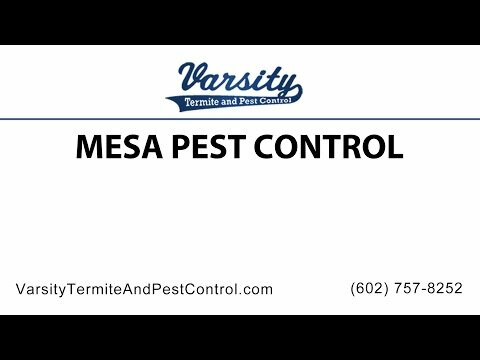 Call the team at Varsity Termite and Pest Control to handle and get rid of the pesty pest from your home!